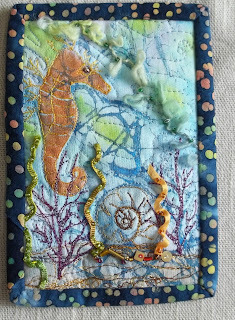 I just popped in for a quick post before the weekend to show my 1st finished postcard. My husband starts his vacation today and while we're planning a stay vacation, I may not be posting as often. We're hoping to get out golfing, biking and maybe kayaking with a little relaxing and lazing about in between. It will be hard to get him to sit for long, as hubby has a few little jobs planned, one of which includes trouble shooting a sensor and wiring problem in my son's car. 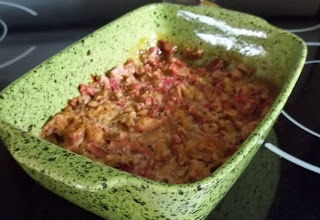 First thing this morning while it was still somewhat cool, I mixed up this very easy Maple Rhubarb Pudding and baked it. I try not to make desserts very often and since there are only two of us to eat it, I made a half a recipe. I understand from a friend that it can be frozen though. It was absolutely delicious. The only thing I would do next time is to put in less maple syrup, perhaps adding a little orange juice instead. When I make a rhubarb crumble I use very little sugar and we are not used to the sweetness. My exercise this morning was in the form of some housework that really needed to be done-- a little vacuuming and mopping the kitchen floor. 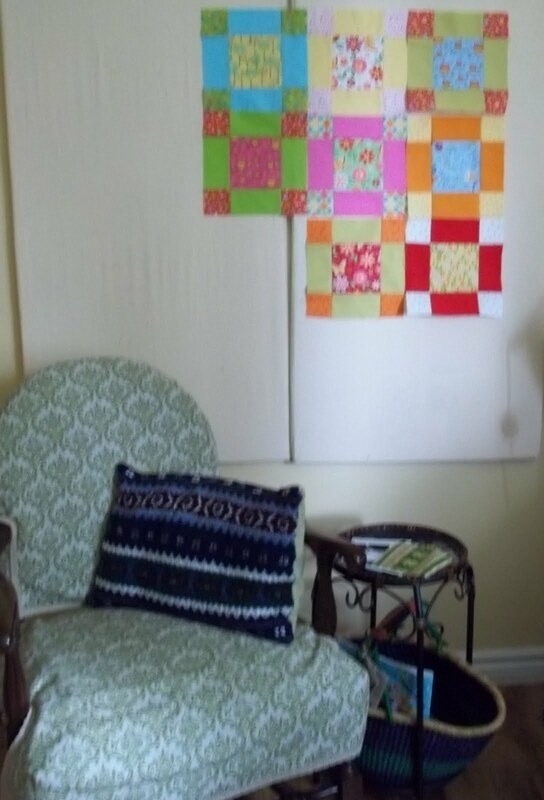 After lunch, we got a quick shower and cool breezes fluttered through the lace curtains in my sewing room. 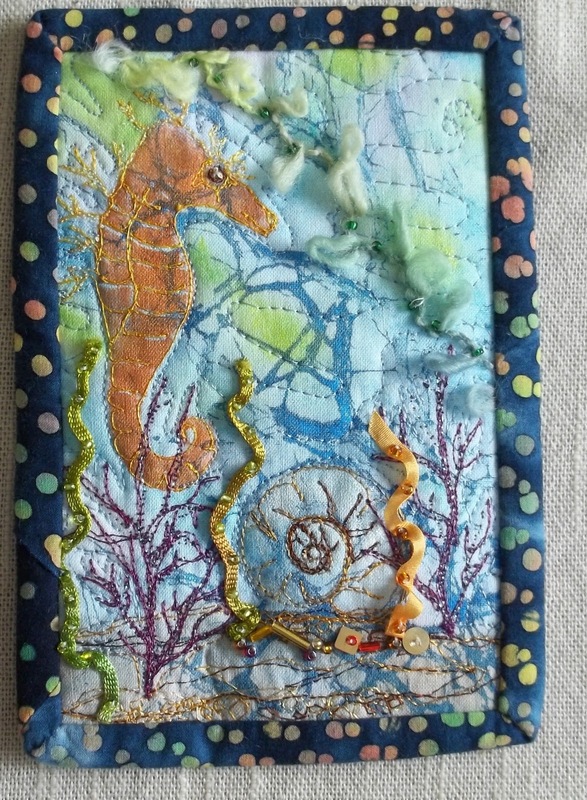 I put on some music and pleasantly passed some time at my machine doing a little more stitching on the second seahorse and the flowers. I think you can see the detail. To-night I'm feeling shaky and tired--maybe the dessert? It's lovely out though; I'm going to try to at least go for a little stroll. 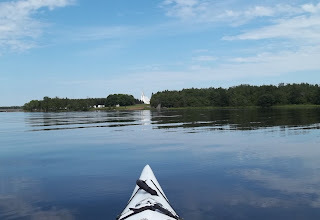 Here is one more picture from Saturday's kayaking. You can see the inkiness of the water and the clouds reflected near the bottom. It is quite otherworldly when your gliding silently through it. While it was another terribly hot and muggy day, I did spend a few minutes doing the thread painting and the quilting on this postcard sized piece. 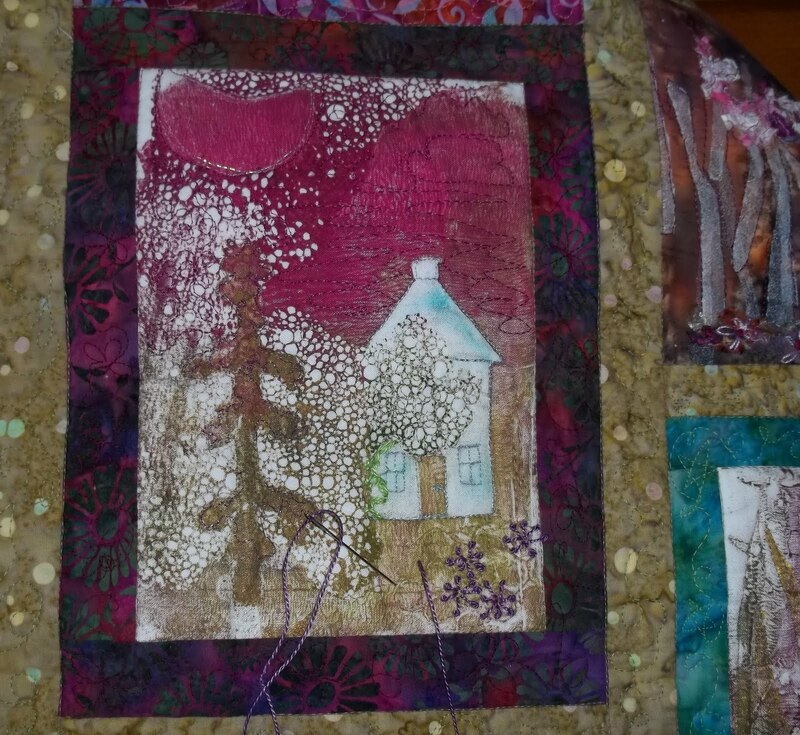 Now I'm almost ready to add some silk ribbon, perle cotton embroidery and bead accents. Am I crazy to do all this on a postcard sized piece? It seems there are quicker things I could do but I can't help myself; I just love the layers of embellishment. I've learned through experience that one really does have to do what makes one happy. 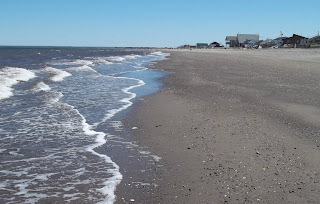 This was the kind of weekend to get out and enjoy the sunshine and summer temps. 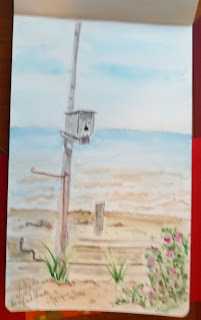 Yesterday hubby and I got up and enjoyed a leisurely coffee and tea on our deck before we headed out to visit a friend's camp on the Pokemouche River about an hour's drive from here. We had lunch at our favorite little bakery/cafe called Les Graines Folies on the way down. 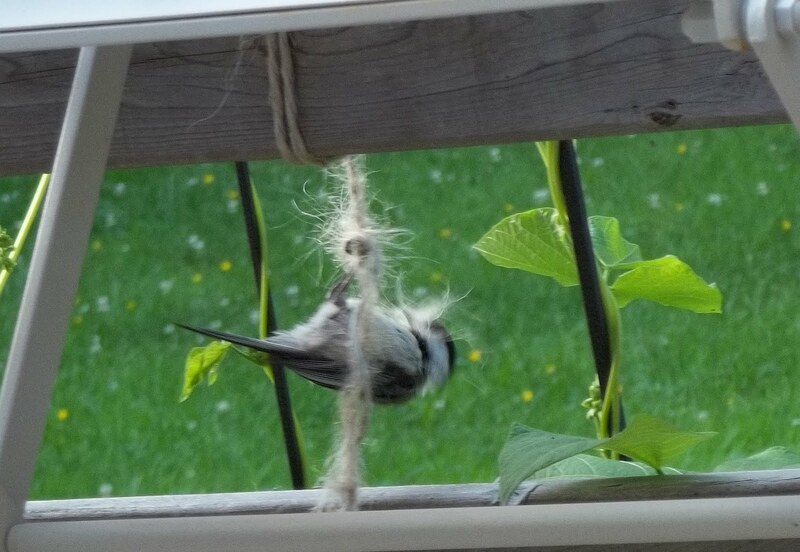 This chickadee has been tearing off bits of sting from this cord for days. It stuffs it's mouth so full you can hardly see the bird. After chatting for a while with our friends on the deck of the cottage, we put our kayaks in the water for the first time this year. It was heavenly and thankfully not too hot. The water was almost inky with beautiful reflections. It was as if we were sailing through the clouds. We were able to stop for a snack and enjoy a leisurely paddle for a couple of hours, and then we had a dip back at the dock. Afterwards we visited some more had supper there and enjoyed a wonderful apple strudel that Claude and Glenda had made. Perfection! Today turned out to be very hot and sultry and my husband had plans to golf nine holes with his father and brother. They went anyway and I went out to visit with his mom at the beach. I sat on the deck in a stupor and almost didn't do anything the air was so hot and heavy. 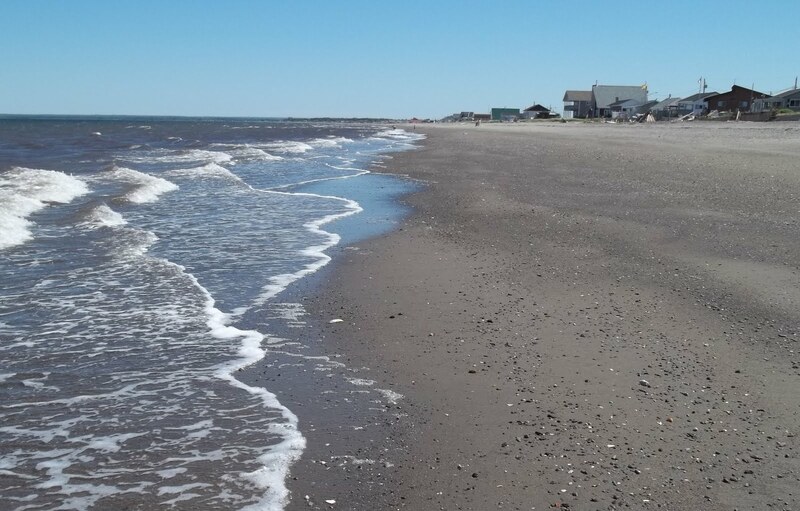 I got into the ocean water though and floated around for a while with a noodle. 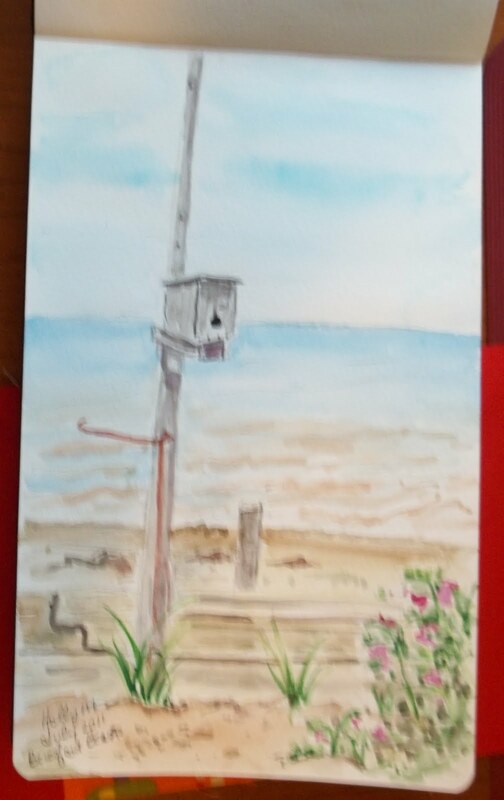 I felt a little revived and did this little watercolor on the deck. I'm not sure what the weather will be for the rest of the week, but if it stays hot like this, I may retreat to the basement where I can only do handwork as my sewing room is on the main level. I only have air conditioning in the bedroom. At least we can sleep well. I don't usually do much on Fridays because I do errands and meet some friends for lunch. 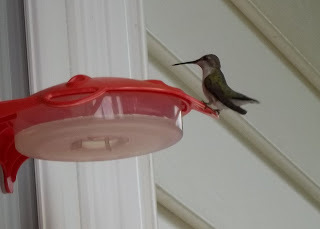 Today, however, I had to hang around for most of the day while awaiting delivery of my new washer and dryer. 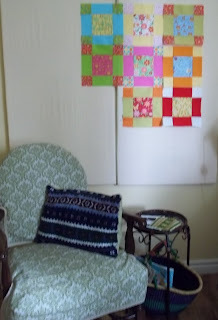 It was a lovely day, not too hot, and so I spent some of it in my sewing room. 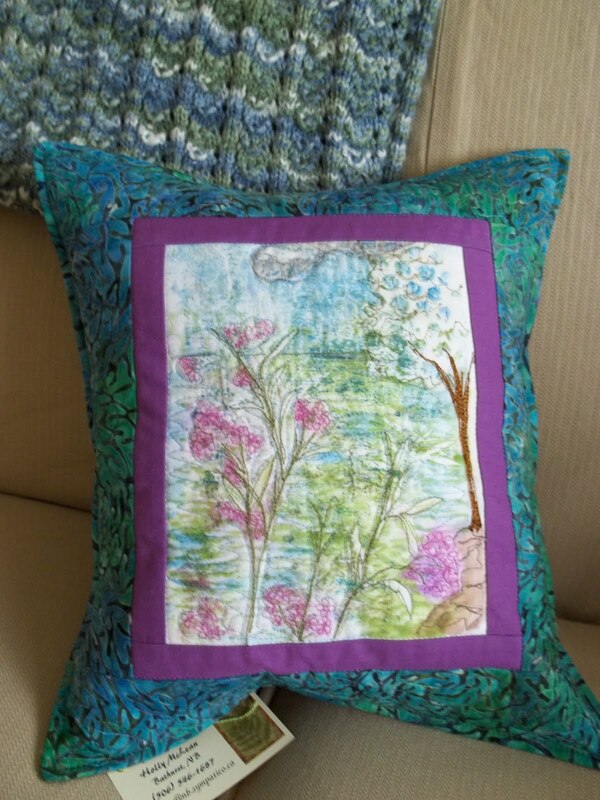 I finished up this pillow finally and got some more cards ready to take down to the shop downtown. 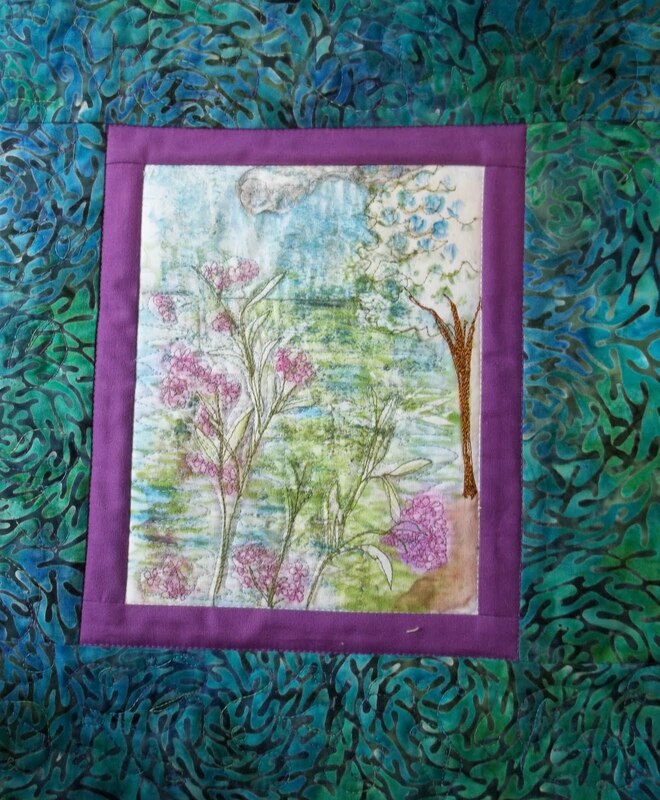 I stopped in on my way for lunch just as a customer was buying one of my art quilts-- the second one this week! 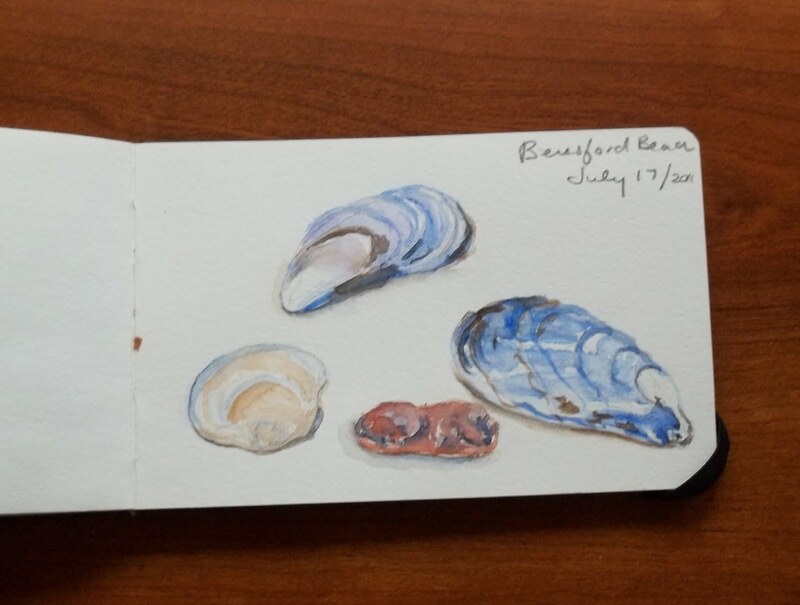 It was my favorite-- a seashell with lots of embellishment. I almost felt sad to let it go, but nonetheless it was still quite exciting. 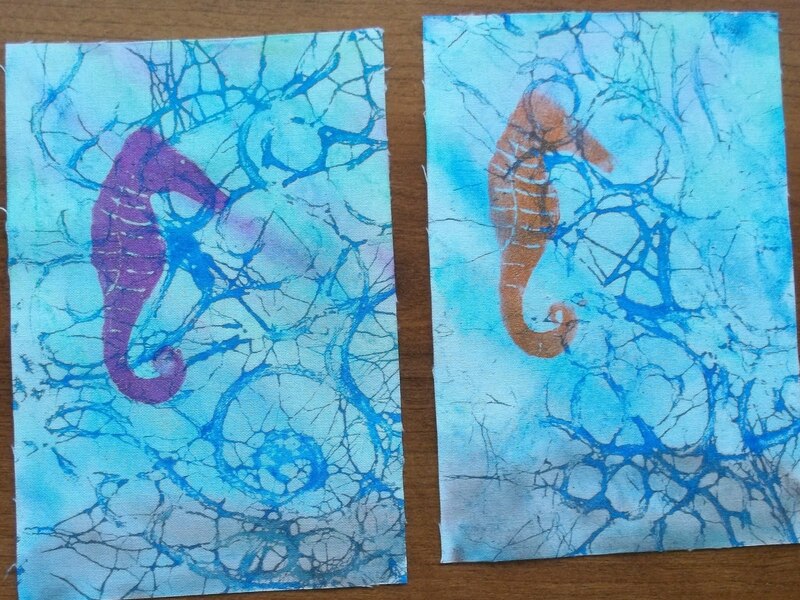 This afternoon I worked on 2 more seahorses and the soy flowers.This is a fabric that I painted some time ago using a flour paste resist. When I did, I just doodled a design and really had no idea what it might become. 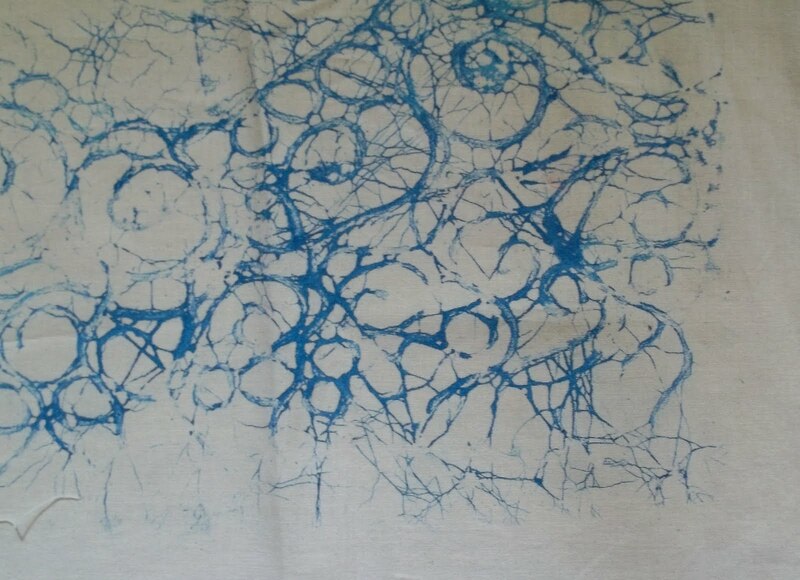 Do you remember looking at clouds and finding shapes? That's kind of what I did with it. 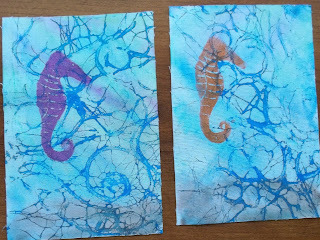 I knew the color and design was watery, so I looked for lines that I could enhance as an underwater scene. 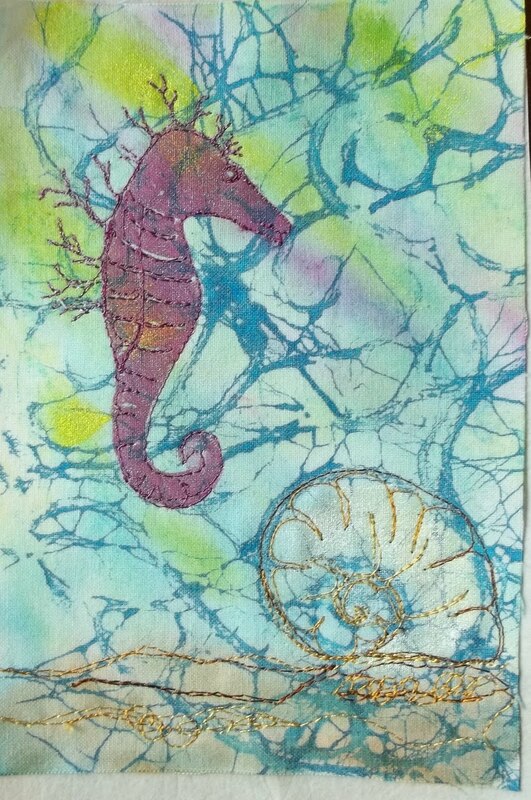 I fussy cut it into 2- 4 by 6 pieces, and I applied Neocolor II crayons, fabric paint and a stamp that I made of a seahorse. 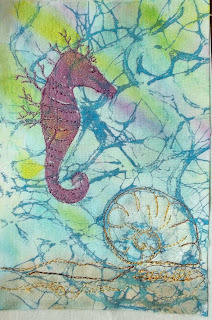 Today, after heat setting the paint, I did some thread painting on the seahorse, the shell and the sand below it. 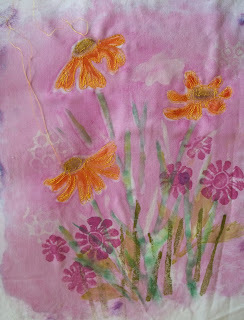 While I had the orange thread on, I also did the orange flowers in this piece which is quite a bit larger. It's tiring to keep changing colors, so I try to work on a few pieces at once if there are common colors. 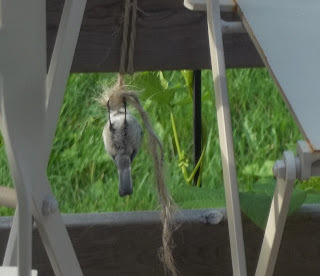 Just before supper time, I made a tea and took it to the swing on my deck. Here are a couple of the views. I could sit there for hours swaying and listening to the birds twittering. 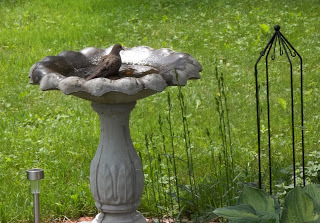 I love to watch them flapping and splashing about in the bird bath too. Several came along while I was watched. 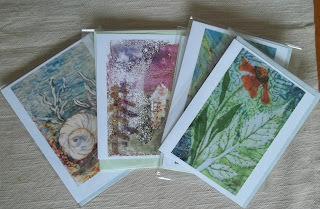 I'm just waiting for my wash to spin out so I can hang it out so I thought I'd quickly write a post. I make my plans according to the weather when I wake up and today it said sunny this morning and clouds with showers this afternoon. It's a lovely cool morning so I'm putting out my wash and heading into the gardens, something I've been putting off because of first, the flies and then, the heat. I have some borage ready to harvest and kale. I've just been reading about borage on line and I printed out a recipe for a salad using the leaves. It seems it's good for many of my ailments. Yesterday, I added some more to my soy wax piece. I still feel as though I've headed in completely the opposite direction of what I wanted but I'm often surprised in the end which is why I want to keep going on this. 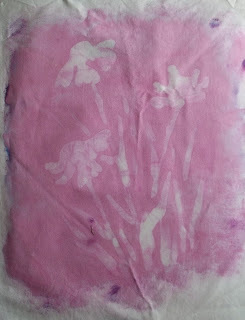 since I was sorry that I covered up the white spaces I used some decolorant (for the first time) to remove some dye. 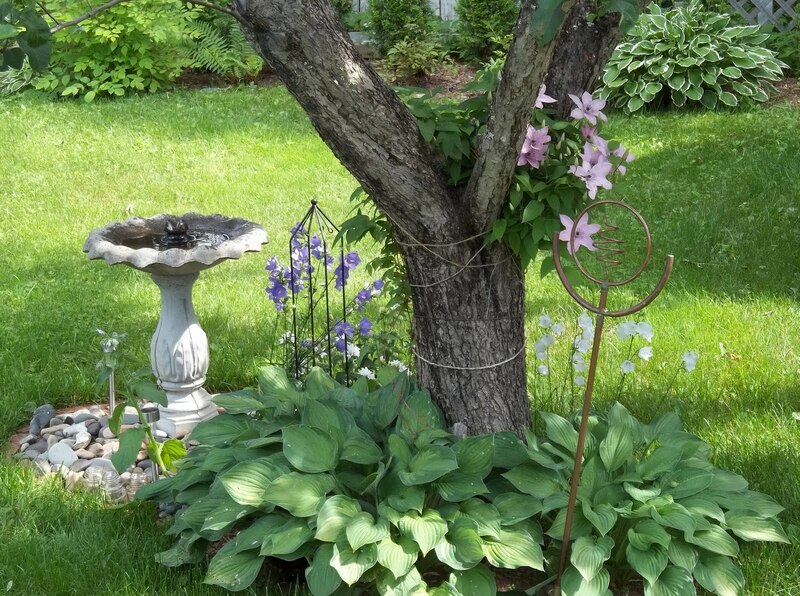 You can see it in the little circles and a small flower as well as a few leaves. 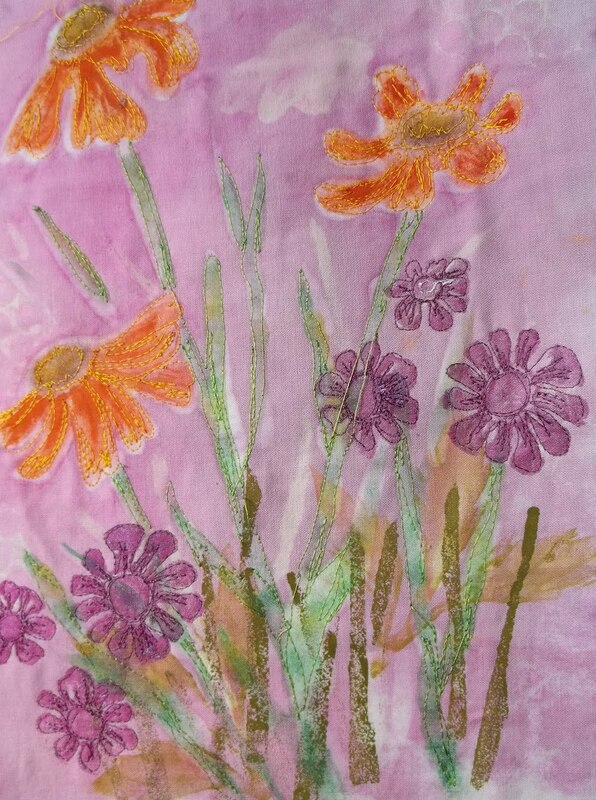 Then after ironing it, I added orange textile paint to the flowers and added some stamped leaves and more flowers. 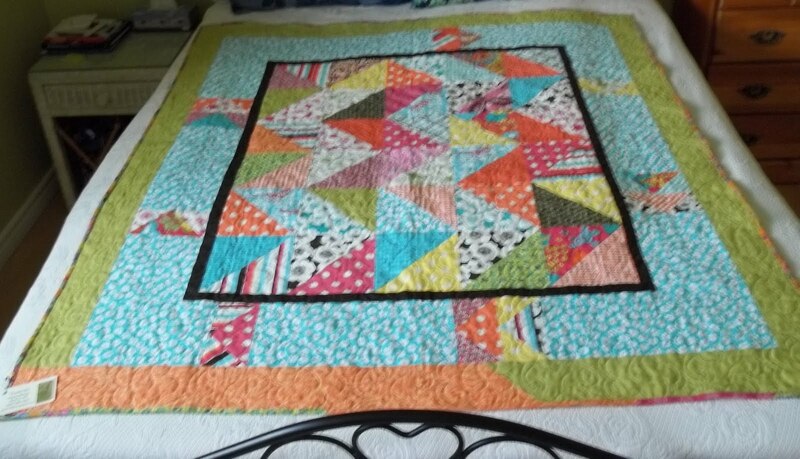 Now, It's ready for the sewing machine. My feeling is that things are a little murky but it may change when I add some bright threads. Gord and I went out for an early 9 holes of golf this morning and this is where I spent my afternoon. I'm sitting here with a fresh mug of tea, listening to the light rainfall outside my window. While recently the rain has been frustrating, today I'm enjoying my indoor time. 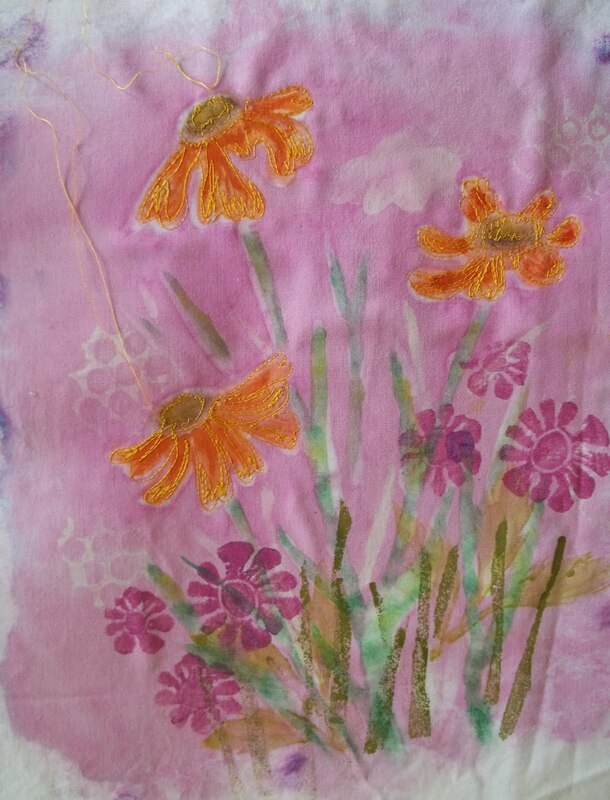 We've had some sunny warm days, so I was happy to sew today. Tomorrow, it's supposed to be nice and Gord and I have a tee time. 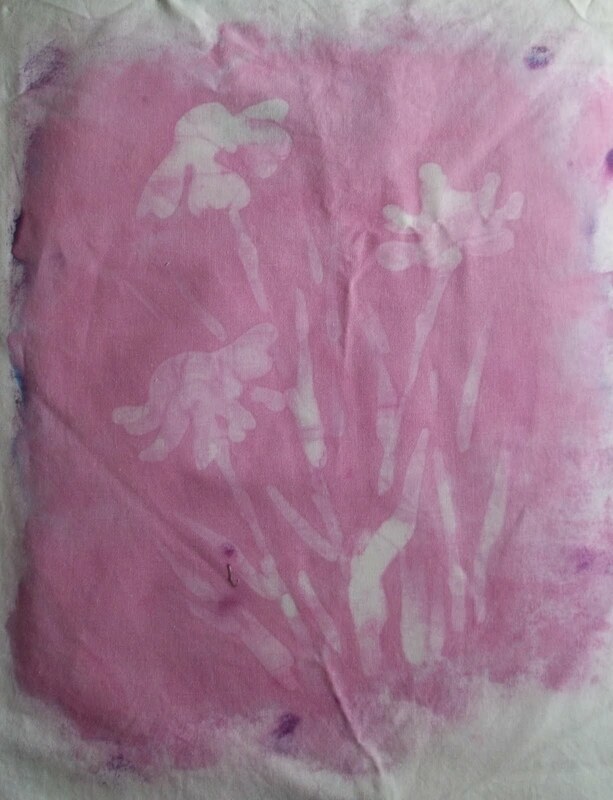 Some time ago I painted this soy wax resist flower piece. Today I decided to try to do something with it. 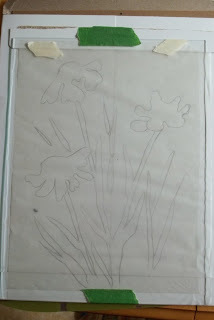 First, I traced the outline of the flowers onto tracing paper which I then taped onto a piece of supporting cardboard. Then I laid a piece of glass on top. 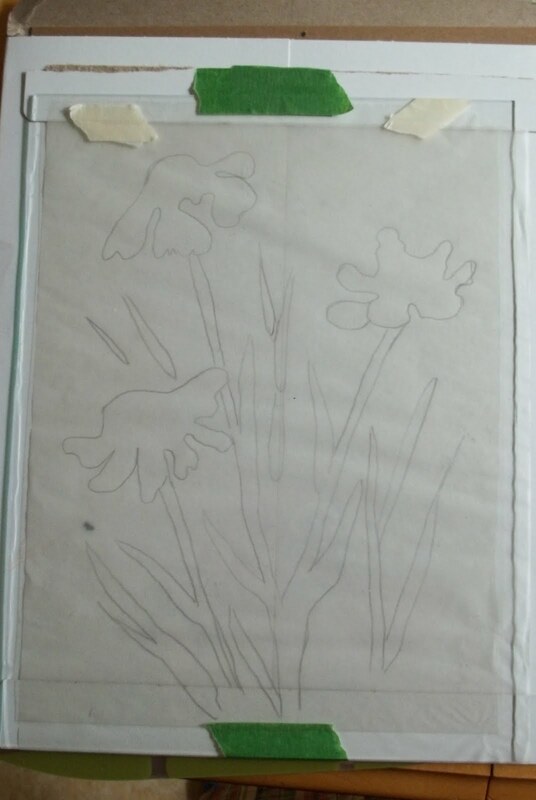 Onto that I taped a piece of thin acetate--Mylar would have been better, but you've got to work with what you've got. I cut it out with a heat tool. It's pretty flimsy but I don't plan to use it much. 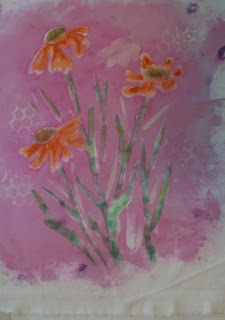 I used my paint sticks and rubbed the color into the spaces cut from the stencil. I always create a dilemma for myself because I'm a doer not a thinker. 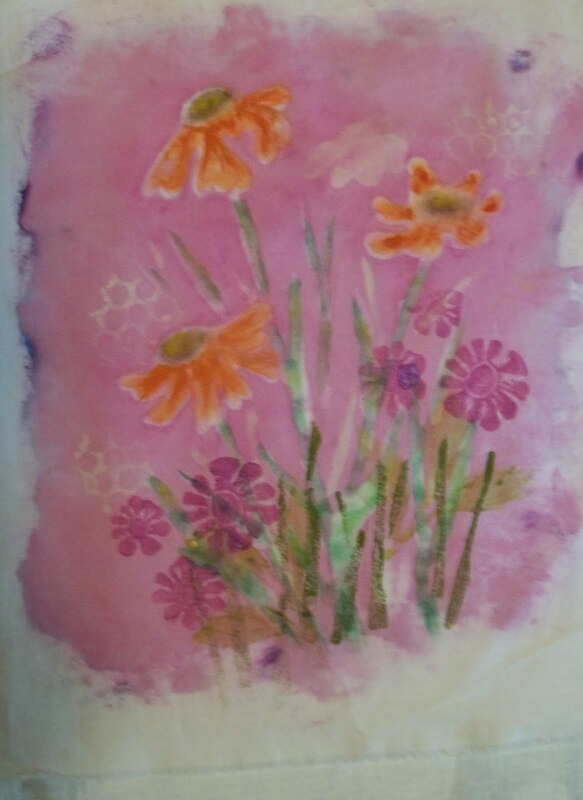 The concept worked but now the flowers are about the same value as the background. I don't see darkening the background as an option. 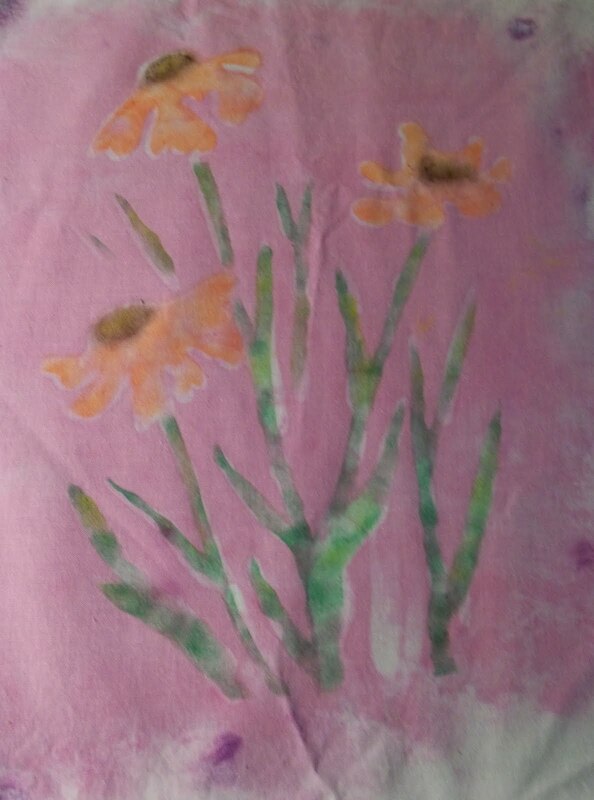 Perhaps, I could darken the flowers with more paint or perhaps the thread painting that I will do will suffice. I would welcome some suggestions. 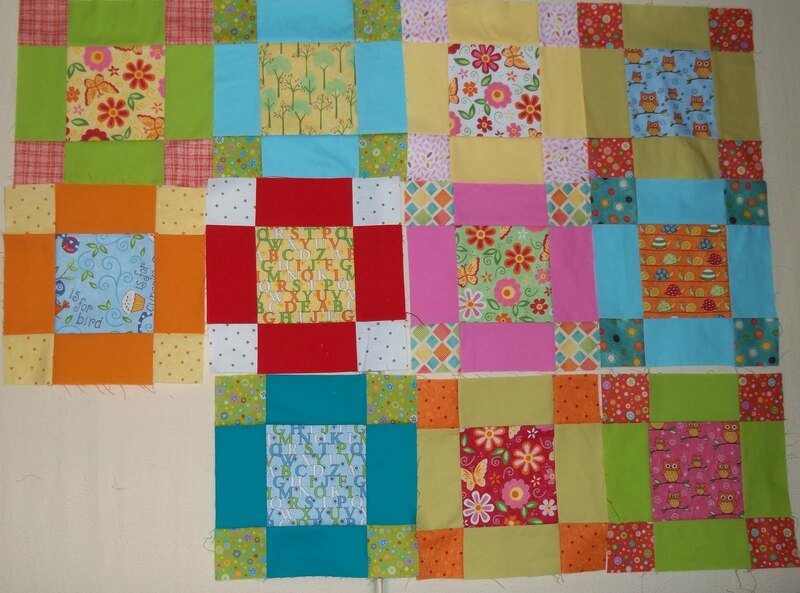 After that discovery, I switched to putting together a few more blocks for the baby quilt and then I cut out a few more. No wonder I'm so slow; I work in bits and pieces. 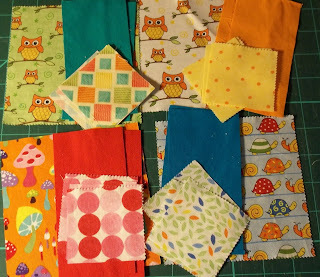 I'm not patient enough to assembly line sew. I've got 11 blocks done, 4 more cut and thus need 5 more to finish the 20 blocks. The centers are all from a charm pack and I'm using some of the 5 inch squares to cut for the corner blocks so it' not much cutting. 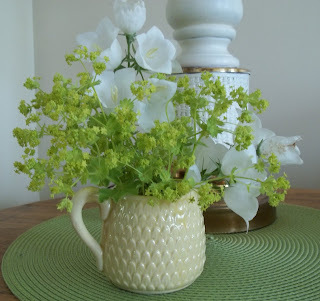 I love it when I can always have fresh cut flowers in the house. Now I need to take time for sketching, but there's mot enough time or energy to do everything. It's an out door time of year and to-night I went to hit balls with my husband. 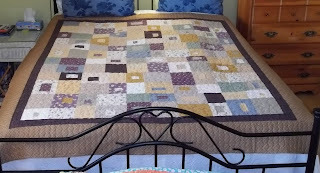 I got another quilt back today from the long arm quilter. It is going to a family member. I took a picture but noticed it seems blurry so I will try again. Still not the best picture. I'm really having problems with this camera. 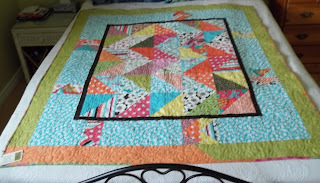 I had a few minutes at the machine today when I finished the machine quilting on my little garden piece, and I sewed a few more blocks for the baby quilt. I'm so pleased to have a little more room to get at my design wall. There was a big rocker there last week which I gave to my son when he was home. I like this chair as it is smaller. It still gives my husband somewhere to sit when were chatting with our daughter via the computer. I'm trying hard not to complain because, yes, we've had a terrible amount of rain, but now it's hot and muggy. It is weather that I do not do well in. Oh well, I pushed myself, and it took a lot, to get out for a little run on my bike early this morning before a 10AM appointment. 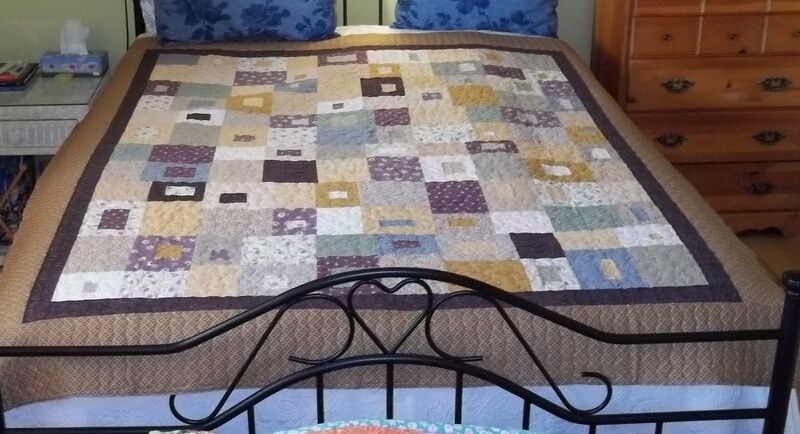 I was home before lunch to a closed up and somewhat cool house, so I put on some Quilting Arts DVDs that I hadn't yet watched and finished the binding on this quilt. 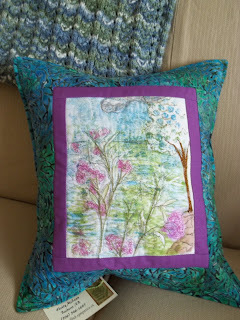 Then I was feeling so comfy that I pulled out my wall hanging and did a little bit of embroidery just before supper. 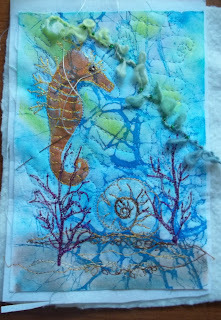 The hand work is almost done except for perhaps some beading. 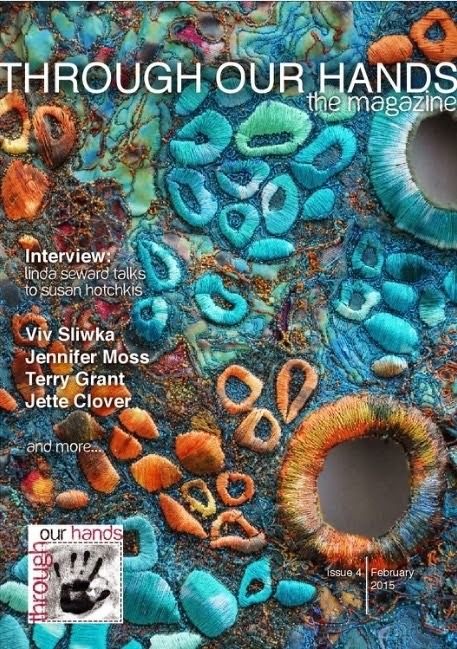 I will then add a bit of a sparkly paint stick, sew on the moth and back it. Soon. The house has been warming up. I just put the air conditioner on in the bedroom and I'm going in after I post this to do a little yoga before my bath. I also resolved my issues with this piece. I was able to shorten the tree because I had actually added to it; I just had to cut out what I had added. Lesson learned. 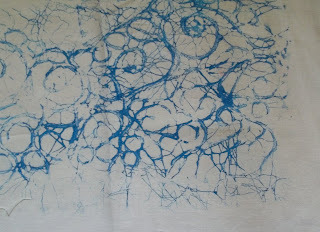 Next time I will use some tracing paper to audition my ideas first. 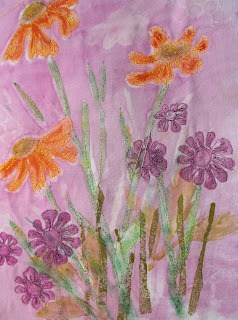 I've painted in some brown and will add some free motion stitching to delineate the ground there. 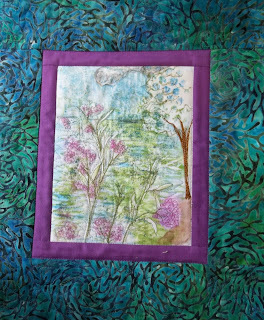 I've almost finished the rest of the quilting and then it will be ready to make into a pillow. Temperatures have warmed up and the sun actually came out on the weekend. Gord and I got out golfing with our son and his girlfriend on Saturday. 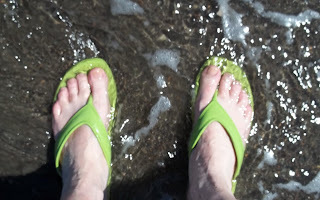 Yesterday, we sent them to the beach with our car and our kayaks while we relaxed and rested at home. Both Gord and Jeremy took Monday off and they went golfing today with Gord's dad-- 3 generations. it was threatening to rain but it cleared and they had a great 18 holes. 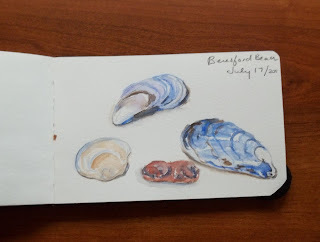 While they were out, I chatted via the internet with my daughter in South Korea. 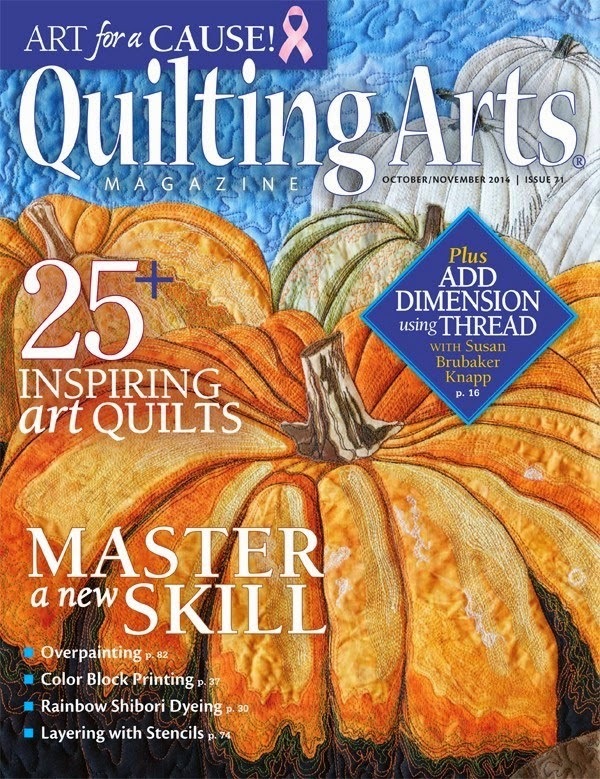 The computer is in my sewing room, so I trimmed my quilt as we talked. Once she went to bed, I sewed on the binding. 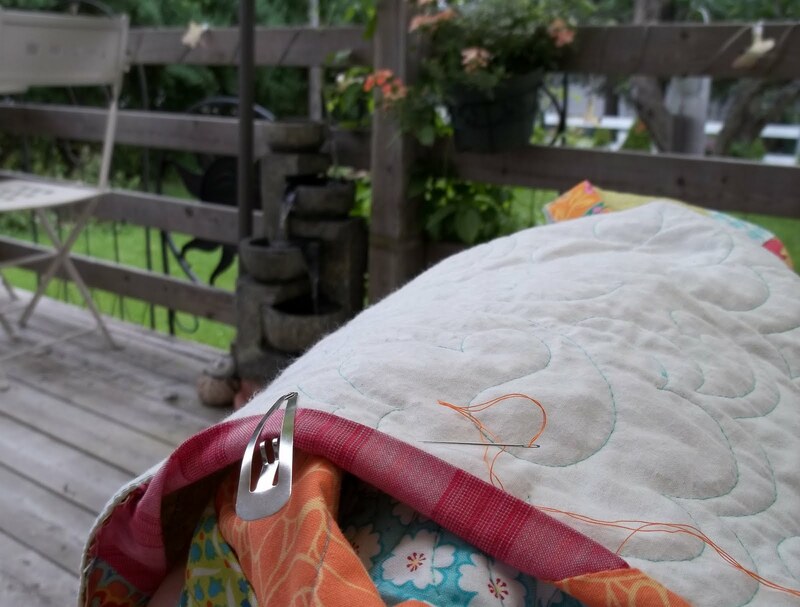 I made myself a sandwich and headed out to my swing on the deck where I started hand stitching the binding to the joyous sound of bird music. I had robins, sparrows, goldfinches, chickadees and a dove all using the birdbath. The back yard and deck was a happy place today until it got a bit too warm and I retreated inside.